Spirit Catholic Radio is a listener-supported 501(c)(3) Catholic radio station with studio locations in Omaha, Lincoln and Grand Island, Nebraska. Our coverage includes most of the state of Nebraska as well as Western Iowa. To view our coverage map, Click here. Our mission is simple. We want all people to encounter Jesus by transmitting the Gospel message over the radio airwaves. Programming heard on Spirit Catholic Radio is a mix of locally-produced shows and national Catholic radio programs from names you know and trust. Spirit Catholic Radio went on the air in Omaha in January 1999 with a weak signal, two employees, one volunteer, a small office, $750,000 in debt and a mission of evangelization. Today, the radio station continues to evangelize through its three studio locations in Omaha, Lincoln and Grand Island, a professional staff and nearly 300 volunteers in eastern, central and western Nebraska and western Iowa. 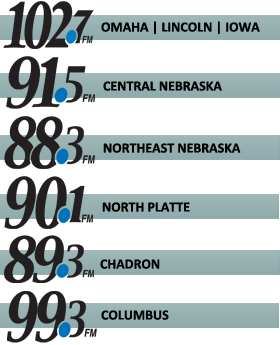 Spirit Catholic Radio reaches over 75 percent of the state of Nebraska’s population with six network signals, nine affiliate signals and the entire state through live online broadcasting and a free smartphone app. Spirit Catholic Radio is completely listener supported, has no annual deficit and continues to be a model for Catholic radio across the country. • Spirit Catholic Radio is 100 percent listener supported–a qualified 501(c)(3). • The network reaches more than 1.4 million people in Nebraska, Iowa, South Dakota, Kansas, Wisconsin and Missouri. • Through streaming audio on the Internet, Spirit Catholic Radio has heard from listeners in six continents, 48 countries, 47 states or providences and 257 cities. • Spirit Catholic Radio receives less than 20 percent of funding from on-air advertising known as business underwriting. • Does not ask for funding from any diocese.